Every day, over 315,000 new items of malware are unleashed by cybercriminals. If you’re going to protect your computers, your mobiles and your confidential information – you need a security solution that keeps up with the very latest threats. Kaspersky Lab’s award-winning security technologies are renowned for their ability to deal with new and emerging threats. Independent tests have shown that our cloud-assisted technologies help us to identify new threats within as little as 0.02 seconds. For real-time updates – and extremely rapid defense against new malware and other threats – Kaspersky Lab is your first choice. While you need to ensure your PC, Mac and Android phone & tablet – plus the precious information you store on them – are fully protected, it’s no good having security software that ruins performance… so you can’t enjoy your digital life to the fullest extent. Despite the growing complexity of new malware attacks that are constantly being launched, Kaspersky Lab has developed security solutions that successfully combine protection & efficiency – so our technologies work ‘behind the scenes’ and your devices can perform exactly as they were designed to. In addition, our special Gamer Mode lets you enjoy an uninterrupted gaming experience on your PC – so you can totally lose yourself in the action. Cybercriminals have been quick to recognize the opportunities to exploit people’s growing use of webcams – and the media is full of reports about innocent users’ webcams being accessed for a range of nefarious activities. How can you stop the spies? Kaspersky Lab has developed totally new Webcam Protection technologies that prevent unauthorized users gaining remote access to your webcam. With our technologies protecting your PC, you no longer have to worry about whether someone has infected your computer and is using your webcam to spy on you and your surroundings. Online banking, shopping and payment systems have helped to simplify a host of everyday tasks – but they’ve also introduced serious security risks, including the potential theft of your passwords, your account details and your money. Whenever you use your PC or Mac* to visit a banking, shopping or payment website, Kaspersky Lab’s unique Safe Money technology checks that the website is secure, ensures you’re not being tricked by a fake or fraudulent website and then opens the site in a special, protected mode. Safe Money effectively adds another layer of security for your online financial transactions – to help keep your bank account & credit card numbers and your personal information out of the reach of cybercriminals. Imagine the chaos that can result if someone accesses your confidential information. If criminals capture your passwords and personal data, they can take on your ‘digital identity’, defraud you of money and cause a range of long-term problems. Because even legitimate websites can be infected with malware – and automatically download malicious code onto your computer, smartphone or tablet – Kaspersky Lab automatically checks all weblinks and makes sure they’re safe… before you visit a website. Our technologies also scan your email messages – to ensure phishing campaigns can’t trick you into disclosing any valuable personal information that could enable others to assume your identity or steal your money. Internet threats can be scary for security-minded adults – let alone innocent children that trust what they see and who they communicate with. However, as the Internet is also a powerful educational tool, you need to enable secure access for your kids. Even when you can’t be with your kids, our award-winning Parental Control features protect your children from Internet-based threats – including sexual predators. Kaspersky Lab makes it easy for you to control how your kids use the Internet, when they can go online and who they can communicate with – whether your kids are using a PC or a Mac. You can block downloads, block access to inappropriate web content, manage social networking and prevent your kids sending key personal information. When you use public Wi-Fi, it’s easy for criminals to intercept your emails, passwords, credit card numbers and more. As well as taking care to protect your information, you also need to avoid excessive charges from Wi-Fi & 3G / 4G network operators. Kaspersky Lab’s new Wi-Fi Security Notification* feature automatically verifies the security of the Wi-Fi connection you’re using, checks for vulnerabilities, warns you about potential risks and advises you on adjusting your security settings. In addition, our new Cost-Aware Networking* feature automatically prevents you exceeding the data limit that you set – so you can easily manage and optimize your data traffic usage, whenever you’re using your PC to access the Internet via public Wi-Fi, 3G or 4G. *Wi-Fi Security Notification and Cost-Aware Networking features are only available for Windows PCs. Cost-Aware Networking is only available for Windows® 8 or higher. If you enjoy surfing, socializing, online banking and shopping – while you’re out and about – you need to ensure your Android phone and tablet are as fully protected as your laptop and desktop computers. Now you can protect multiple devices, with just one product and one license. 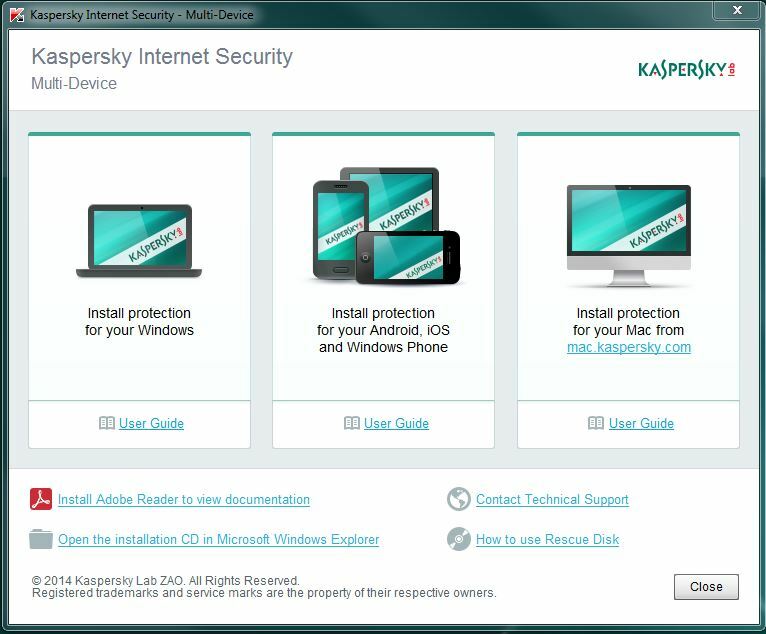 Kaspersky Internet Security – Multi-Device can secure a combination of PCs, Mac computers and Android phones & tablets. You’re free to select the combination of devices you protect. With a 5-device license, you could protect 1x PC, 2x smartphones & 2x tablets… or 1x Mac, 2x PCs & 2x tablets. The choice is yours. 99% of mobile malware is targeting Android devices. Furthermore, as smartphones & tablets are so compact, they’re easy to lose – or for criminals to steal – so your personal information, bank account & credit card details could fall into the wrong hands. Kaspersky Lab’s easy-to-use mobile security technologies – and cloud-assisted protection features – are optimized to protect your Android phone & tablet against the latest viruses, spyware, Internet-based attacks and more. In addition, Privacy Protection features let you hide details about your contacts, calls, text messages and logs – while, if your phone is lost or stolen, special anti-theft features let you block the device, delete data from it and find its location.